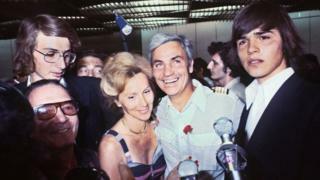 Michel Bacos, the Air France captain hailed as a hero for refusing to abandon his passengers when Palestinian and German hijackers seized the plane in 1976, has died in France aged 95. The plane, carrying some 260 people from Tel Aviv to Paris, had stopped off in Athens, where the hijackers got on board and demanded it change course. The hostage drama ended six days later at Entebbe airport in Uganda, when Israeli commandos stormed the terminal. Bacos died in the French city of Nice. Awarded France's highest civilian accolade, the Légion d'Honneur, he told the BBC in 2016 that as captain "it would be impossible for me to leave my passengers, unimaginable". The youngest of the Entebbe survivors, Benny Davidson, said Bacos was a role model and had taken a leading position on behalf of all of the hostages. Nice Mayor Christian Estrosi said: "Michel was a hero. By bravely refusing to give in to anti-Semitism and barbarity he brought honour to France." What happened to Air France flight 139? After leaving Athens on 27 June 1976, the plane was seized by two Palestinians from the Popular Front for the Liberation of Palestine and two Germans from guerrilla group Revolutionary Cells. They forced Bacos and his crew to fly to Benghazi in Libya. After refuelling it flew on to Entebbe where the hijackers were joined by at least three more Palestinian militants and Ugandan troops. Uganda's leader, Idi Amin, was on the tarmac to welcome the hijackers. The hijackers demanded the release of 54 militants and a $5m ransom. The passengers were eventually split up. The non-Israelis were flown to Paris while the 94 remaining passengers were forced to stay. The hijackers held all the Israeli passengers hostage as well two religious Jewish couples from the US and Belgium, according to eyewitness Ilan Hartuv. Alongside the hostages were the Air France crew of 12. "I told my crew that we must stay until the end, because that was our tradition, so we cannot accept being freed. All my crew agreed without exception," Bacos told the BBC. Benny Davidson described that moment as "the ultimate decision". "It was very brave to stay with us and tell all his crew 'I made this decision on my behalf and you can choose whatever you want'. All of his crew stayed with him to the last minute," he told the BBC. "Whenever someone needed something, he took a leading position on behalf of the hostages and spoke to the terrorists or the Ugandan authorities." Israeli commandos eventually stormed the terminal on 3 July. Two hostages were killed during the rescue, and Michel Bacos revealed that the hostage-takers opened fire on the group killing a third as the Israeli operation unfolded. "I thought France would try to save us. There were French forces stationed in Africa, closer than Israel, but either way I knew someone would come rescue us," he said in a separate interview with Israeli daily Yedioth Ahronoth. Mr Davidson said the pilot's fearless attitude served as an inspiration to all the children caught up in the drama. "He set an example as a role model and how to behave even though all hell is breaking loose around you." Clarification 4 April 2019: The passengers whom the hijackers refused to release included four religious Jews who were not Israelis and this article has been amended to make that clear.